Between 2014 and 2018 Phil@poste has released several philatelic issues forming part of an ongoing theme commemorating the centenary of the First World War. To date these include some six LISA vignettes. 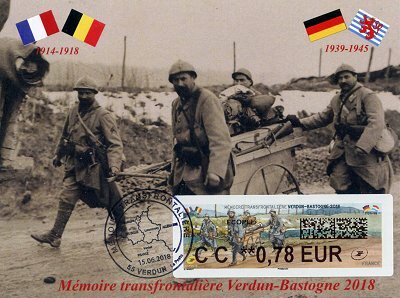 The first design was issued in 2014, during the Paris Salon Planète Timbres (see article, also published in VARIABLE 33), followed by two issues, in 2016, on the occasion of the centenary of the Battle of Verdun (articles and VARIABLE 40 & 43). 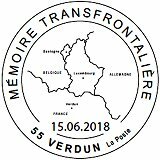 A further issue commemorates the centenary of the entry into the war of the United States (article and VARIABLE 46), and another two in 2018, during Paris-Philex 2018 (article and VARIABLE 49), and again in Verdun. In collaboration with the Mission Histoire du Conseil départemental de la Meuse, La Poste produced a new vignette LISA and pictorial postmark commemorating cross-border relationships during the two World Wars, in a region spanning four countries and including the two cities which were the scene of some of the bloodiest battles i.e. the battle of Verdun during the First World War, and Bastogne, in Belgium, during the Ardennes offensive in the Second World War. The design by Geneviève Marot shows the image of four 'poilus' or French soldiers transporting weapons and equipment in a cart. The flags of the four countries, France, Belgium, Germany and Luxembourg complete the design, with the dates of both wars. The design is based on a historical photograph of April 1917. Mission Histoire reproduced this photo, along with other vintage photographs, as postcards. This new special issue could only be obtained on Friday 15h of June 2018, in one of the IER LISA 2 XP postal kiosks installed at the Verdun post office. Phil@poste produced 15,000 labels with this design, printed on thermal self-adhesive paper, with phosphorescent vertical stripes at the edges of the design. 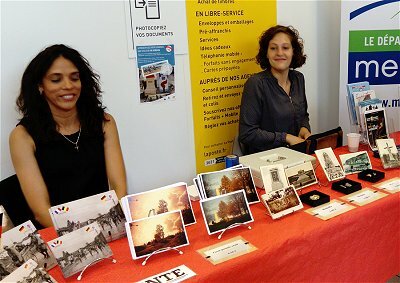 During the event, Mission Histoire (image below, right) and the local philatelic association, the Groupement Philatélique de Verdun, set up tables where they sold postcards and other commemorative material. 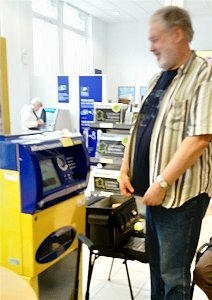 The postal kiosk installed at the La Poste branch, was connected to the postal network, allowing visitors to purchase variable value stamps with all the available shipping options, as per the existing software program and postage rates. Fortunately, the designer took into account the printing of the 2D Datamatrix code on all stamps, so she focused the main design on the left of the label. The machine was programmed to only allow the purchase of stamps with a face value of 0.40 EUR and above, the minimum current postal rate, corresponding to the new 'Service de Suivi'.